There are 54 million Hispanic persons living in the United States, making them the largest minority group in the country. Disaggregated data on Hispanic subgroups are needed to understand the health of Hispanic persons of diverse backgrounds. A new NCHS report presents selected estimates of health measures for all Hispanic adults aged 18 and over and for the following four Hispanic subgroups: Central or South American, Cuban, Mexican, and Puerto Rican adults. Comparisons are also made across the subgroups and with the non-Hispanic U.S. adult population as a whole. Overall, Puerto Rican adults consistently reported poorer health status than non-Hispanic adults. Puerto Rican (19.2%) and Mexican (17.4%) adults were more likely than Central or South American (12.3%) and Cuban (14.7%) adults to be in fair or poor health. Puerto Rican adults (27.3%) were more likely than Central or South American adults (16.6%) to have had multiple chronic conditions. Puerto Rican adults (6.2%) were nearly twice as likely to report serious psychological distress in the past 30 days compared with Central or South American adults (3.3%). Puerto Rican adults (11.4%) were more likely than Central or South American (2.9%), Cuban (3.9%), and Mexican (4.8%) adults to be unable to work due to health problems. 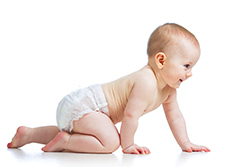 Between 2000 and 2014, life expectancy at birth in the United States increased by 2 years. The non-Hispanic black population experienced the greatest gain, followed by the Hispanic population. The non-Hispanic white population experienced the smallest gain. Changes in life expectancy over time are directly affected by increases and decreases in age-specific death rates and age-specific cause of death rates. NCHS released a report this week describing the relationship between increases in all-cause age-specific and cause-specific death rates and the change in life expectancy for the non-Hispanic white population between 2000 and 2014 is explored. 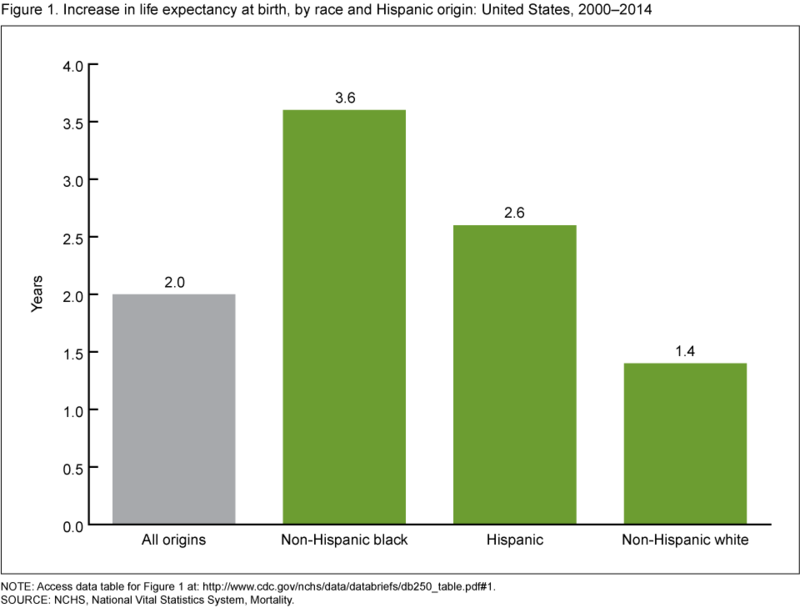 Between 2000 and 2014, life expectancy increased by 3.6, 2.6, and 1.4 years, respectively, for non-Hispanic black, Hispanic, and non-Hispanic white persons. The 1.4-year increase in life expectancy for non-Hispanic white persons would have been greater if not for increases in death rates due to unintentional injuries, suicide, Alzheimer’s disease, chronic liver disease, and hypertension. Increases in death rates due to unintentional injuries, suicide, and chronic liver disease were large enough to increase all-cause non-Hispanic white death rates for ages 25–34, 35–44, and 45–54. Increases in death rates due to unintentional poisonings for ages 25–34, 35–44, and 45–54 had the greatest impact on the change in life expectancy for non-Hispanic white persons. You are currently browsing the NCHStats blog archives for June, 2016.